What kinds of activities do you do during workshops? We start with simple background information on clowning and general rules every clown should know. Then we move on to space exploration and partner connections through energy sending games and simple theatrical exercises. Afterwards, we start focusing on our breath. Using some basics of martial arts, we start connecting our breath to different sounds, and then those sounds to our surrounding and our movements. This is how each of the members initially creates his/her own gibberish – a language of clowning personalities. We develop our gibberish even more through different role-playing games in which the participants are only allowed to speak gibberish. This is how the basis for a clown personality is developed. Later on we move to partner contact work to see how the clowns react, determining whether they are rather superior or inferior clowns. We also have small puppets and “bringing objects to life” workshops. During our session, every participant is encouraged to think of different energizers, small games, and activities to do with kids as well. After visiting kids, we have a reflection session in which we talk about where our clowns struggled while interacting with kids and try to figure out what we can improve for the next visit, finding solutions together. How do the workshops prepare students to interact with kids who may be dealing with difficult situations in their own lives? The workshops teach students how to deepen their sense of empathy. They also teach students how to be more confident in their presence, a better listener, and more present in their bodies. They teach students how to find innovative approaches to things, objects, situations and people around them. But how do they prepare students to interact with the kids? They simply don’t. Because you can never be prepared to deal with kids. The kids are small creatures thinking outside of the box and making the weirdest decisions and connections ever. And that’s the beauty of it. The workshops don’t prepare you, but they teach you how to accept every single request, situation, touch, smile, word, order; how to accept the challenge of never saying no to anything and just going, putting yourself out there fully without giving it a second thought; they teach how to go back in time and become a part of the unknown world of the kids in which everything is possible — the world in which you, as a clown, by accepting everything they say, give kids their personal autonomy and the possibility to make their own decisions and have full control over you. What drew you to clowning and what are its connections with physical theatre? I started teaching clowning as a simple pantomime format before realising how much psychological work it demands. So I went through different peer support training, martial arts practices, and movement therapy. Then I went back to circus studies and performances, and only then did I connect all I learned and develop my own approach to spreading the beauty of circus arts to other people. 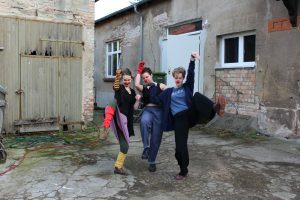 The language development part is based on physical poetry, a physical theatre style that was developed in the Czech Republic only 20 years ago. The simple exercises rise from no theatre, butoh theatre, and simple body-mind practices from several martial arts that performers often use to stay present and energized on the stage. This also goes back to active listening and empathy skills. And then, of course, the puppet work, sounds, the voice, and movement exercises are directly derived from physical theatre practices… I guess I stole a little bit everywhere and put it together. How/when did you personally find clowning? Ha. I guess it was more of like clowning found me. No, really. I was studying physical theatre but was also very passionate about social sciences, community service, and social engagement. I was thinking about how to bring these fields together, and then I changed schools. In my new program I was expected to do social services, and the school was already offering clowning as a club in social service activities, so I took part in it. Even though the clowning we did back then was more performative than social, I directly found myself in it. Then I slowly started taking the club over, turning it into a more theatrical but also social-service oriented club. Then I met a person that really helped me to dive deep into the whole magic of medical clowning, an amazing Danish girl who’s been clowning for 3 years that came to give us a workshop. So everything happened very naturally, organically. But after I had finished at that school, I didn’t think about continuing clowning much. But then I was taking some time off and everytime I would get bored or feel as if I was starting to lose control over my life, I would go and clown for different organizations, NGOs, or just simply give workshops to people. It was only very recently in my life that I realised clowning is something that goes with me everywhere I go. That silent, almost invisible presence of a red nose in my pocket has been there for every minute of my days in the last four years. 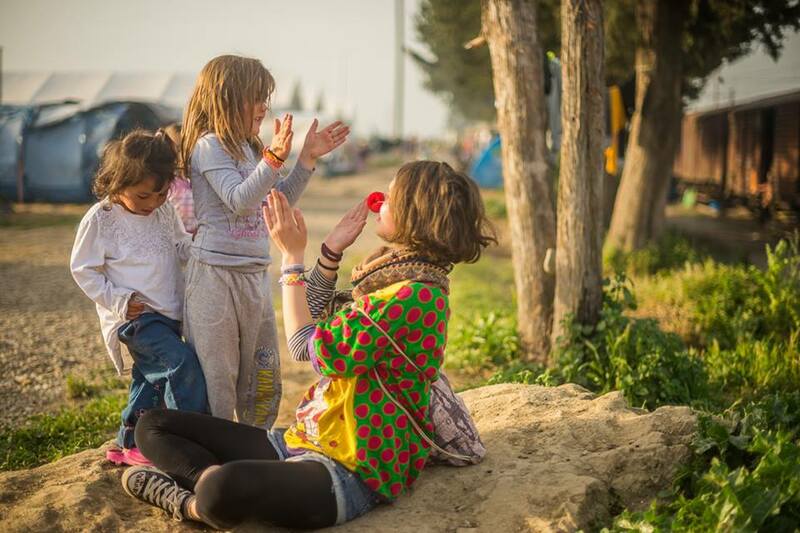 Can you describe your experience with medical clowning and clowning in the refugee camps? As I mentioned before, I sort of started playing with the idea of clowning in my high school and started going to different kids festivals, kindergartens, special needs schools, and orphanages with my group of clowns, which was slowly but surely transforming from a group of performers to a group of real social clowns. Afterwards, I did a little bit of clowning in a circus school in Scotland, but there the clowning itself had more of a performative value to it again. It was only a little more than a year ago that I became a freelance clown and went to my first real project in a refugee camp in Serbia, where I stayed for 2 months. Afterwards, the police closed the borders, closed the camp, and I moved to Idomeni, Greece, where over 40 000 refugees were settled in a muddy field next to the Macedonian borders. I think this is where I got the first real lesson about the world and I and my clown found ourselves facing the biggest disillusionment in our lives. I thought that all the bizarre things we saw in the small camps of around 500 refugees in Serbia was as bad as it got, but we had no clue. 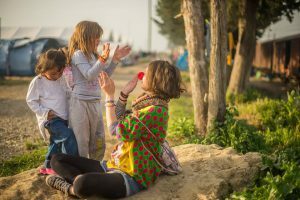 After the first two to three weeks in Greece, both of us understood that the refugee camps in Serbia were more like calm summer camps where we just played with kids and occasionally distributed hygiene items, or supervised sleeping men during the nights. But Greece showed us and taught us a lot. Me and my clown stopped clowning and started saving kids from the tear gas instead. We started taking 15 year old boys with broken ribs and legs to the hospitals after they were beaten up by the police. I think it was that part of me, that red nose in my pocket, that kept me going in those situations. It was the pack of balloons my clown would sometimes make me distribute to the kids so I could see their faces shine with smiles again and regain some faith. It was my clown that made amazing friends with other incredible clowns and volunteers he met in the dusty fields of Greece. It was my clown who got wildflowers from all the kids and then secretly gave them to me because he knew how much I needed them. It was my clown that watched over me while I was sleeping so I would not have nightmares about all the things I had seen during the daytime. It was my clown that pulled me together when I felt like I couldn’t anymore, and brought back all my joy when he got a drawing of a princess from a 6 year old girl. I guess that is also one of the beauties of clowning. You get to meet your best friend that is always there for you. He is hidden there, in that red nose you carry in your pocket.